This is a very basic timeline for the Ad Astra universe. 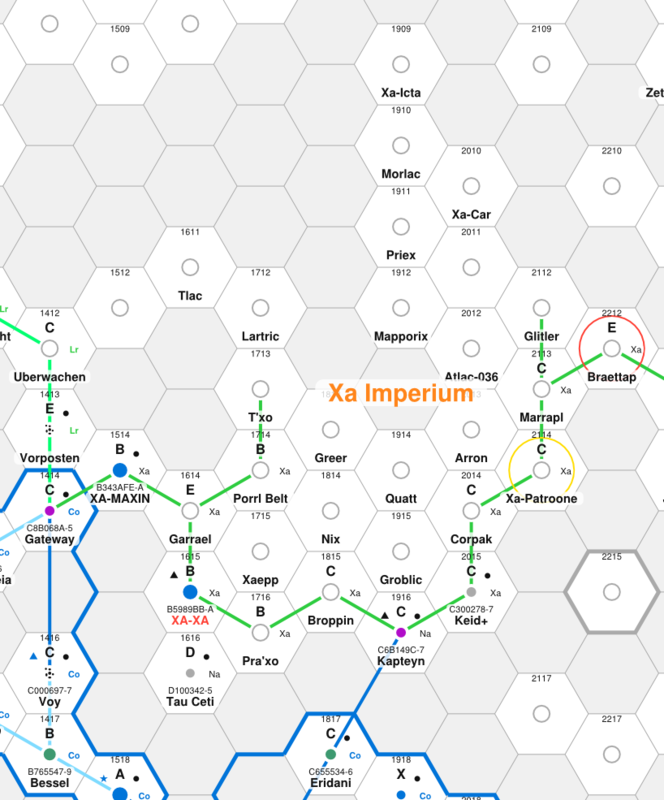 The Xa-Imperium as it is today. 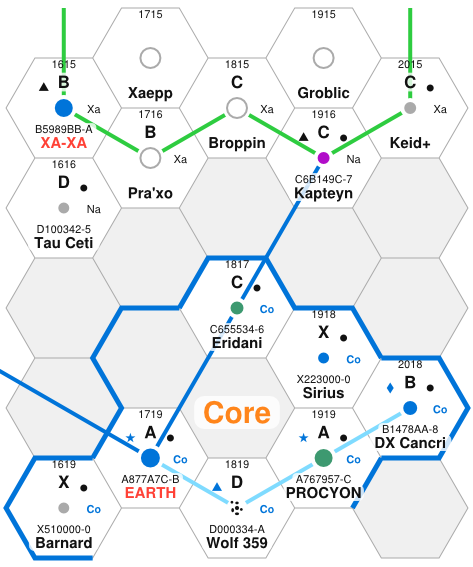 When humanity first ventured to the stars, the Xa-Imperium was much larger than it is today. The Esperanzan Commonwealth has seized the Corridor branch. 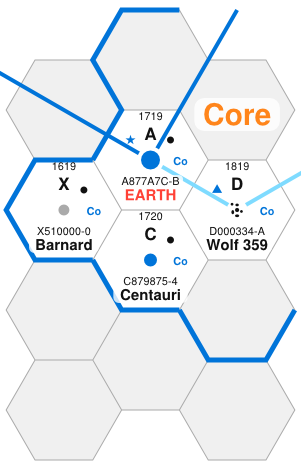 To spinward, the Long Republic – another human state – has pushed them back almost to Xa-Xa (1615), their home world. To trailing, their “Bol” slave species has rebelled and cut them off from everything beyond Braettap (2212). The Corridor, from Esperanza to Gateway. The Corridor was originally a backwater – a branch off the Main, controlled by the Xa Imperium. When humans colonised Esperanza (1518) and then Bessel (1417), the Xa incorporated them into their empire. Soon, however the Esperanzans rebelled, and over nearly four centuries of warfare, they eventually expelled the Xa from Corridor altogether. Esperanza is a gas giant moon in the Epsilon Indi system. It was colonised many centuries ago, in the second wave of sub-light exploration from Earth. Esperanza’s native flora is typically blue-coloured, although many Earth species have been successfully introduced – especially crop plants. The huge population mainly live in spawling cities. 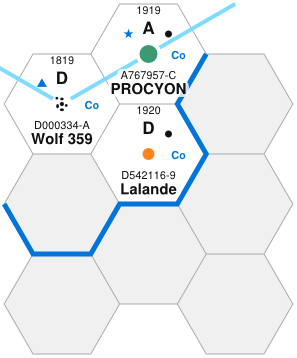 There is an orbital starport city (pop=10m), with a space-elevator linking it to the downport. 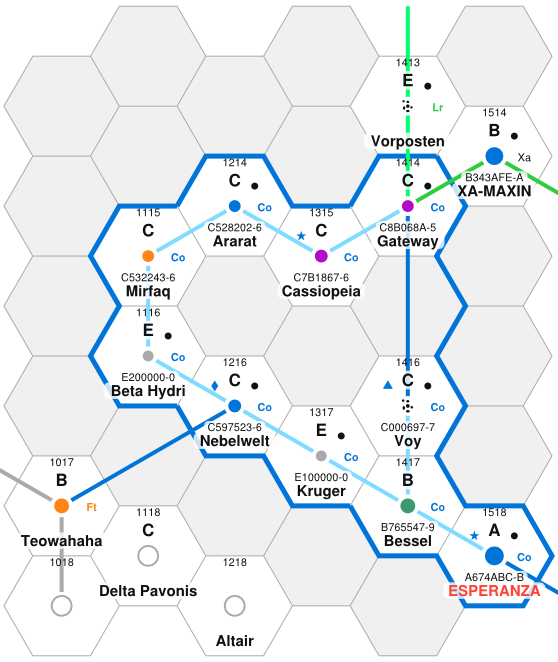 Esperanza is the capital of the Esperanzan Commonwealth, a tyrannical empire that governs the entire human Corridor as far as Gateway (1414). The Commonwealth is dominated by telepaths, who claim to be the “Next Step” in human evolution. Non-telepaths are treated as second-class citizens. Dissidents are in constant danger of detection by the “Thought Police”, who can send them to “re-education camps” with only the thinnest veil of due process. The Commonwealth has recently seized control of the Earth system, and has already made its first abortive attempt to conquer Procyon, the last bastion of human freedom in the Core worlds. Wolf 359 is a red dwarf star. The only reason for the settlement here is that it lies on the Jump-1 route from Earth to Procyon and beyond. The inner system has a dense asteroid belt, that contains the basic starport. The starport is home to a number of refugee families who have been unable to find passage onwards to Procyon. Asteroid miners extract Helium 3, which is sold on as premium fuel at the starport. Smugglers & outlaws are suspected to use the belt as a hideout. There is also a recently established Earth Union fleet observation post – its mission is to support the blockade against Procyon. There is a single planet – a gas dwarf (named “Cub”) in the far out system. A small deuterium mining post extracts fuel from its atmosphere. Cub is believed to be a captured planet. The old Earth Union sponsored a research base to investigate it. The base is now running short of supplies. Wolf 359 is a flare star, which can suddenly emit deadly bursts of X-rays. Habitats and ships in the inner system must be flare shielded at all times. The only settlement on Lalande is a luxury villa belonging to Nora Herzog Wittelsbach, an Old Earth noble. Since the fall of Earth, the duchess now lives here full time – whilst still retaining a good deal of influence on both Earth and Procyon. The compound is defended by ground based weapons and two system defense boats. DX Cancri is a red dwarf star. The colony is located on an inhospitable gas giant moon. It was founded only a century ago by William Chu, a young radical from Earth’s Favoured caste. Chu is adored by his followers. His decisions govern every aspect of life in the colony. He has preached rejection of the Uploads, and the destruction of the caste system. Ever since, the colony has been a destination for Earth’s disaffected. Chu still runs the colony, even though he is now very elderly. The Commonwealth has reached out to the Cancrites, arguing that they have a common cause against the Uploads. Many Cancrites are sympathetic, but Procyon stands between them and Earth, and Cancri is too poor to threaten Procyon in any case. This binary system (Alpha=G2, Proxima=K1) is the closest star to Earth’s Sun. The planet called “Centauri” orbits Alpha Centauri. Its land surface is mostly island chains and a few small sub-continents. There is lush green vegetation. Wildlife is mainly insect-like creatures, none of which grow very large. The world was colonised by Earth’s very first wave of slower than light ships. The early colony failed to develop much vitality. A second wave of colonists arrived once jump drive was introduced. These were mainly low tech utopian religious (Wheelie) communities from Earth’s underclass. The original colony still exists, but it is just one community amongst many. The warrior castes of rival Wheelie nations regularly battle each other without significantly disrupting the majority of agricultural communities. There are chaos cults in the outback, which are feared by all. The primitive Centauri colony was protected by an indulgent Upload elite on Earth. Now that the Commonwealth has taken over, it is only a matter of time before they begin to exploit such a valuable nearby garden world. Already there are plans afoot for “relocation camps” in the outback. 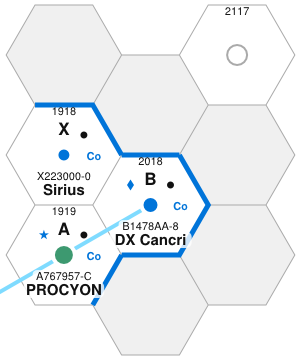 The starport has a contingent of Commonwealth Marines, and the system is patrolled by a squadron of Earth Union frigates. 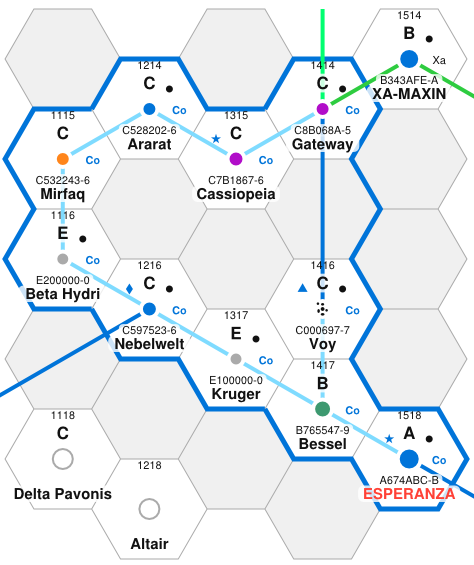 This system is the key waypoint for ships destined for Kapteyn and the Xa Imperium. Commonwealth starships regularly patrol the system, to discourage Procyon-registered vessels from using it. As a result, most Procyon traders now travel via Sirius. 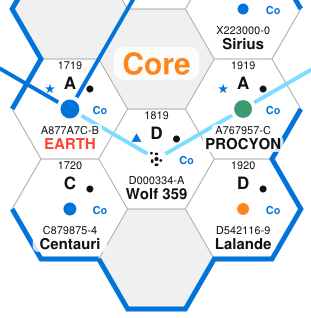 The colony is on Epsilon Eridani b-4, a large gas giant moon, well outside the star’s habitable zone. It is in the late stages of a centuries-long terraforming project – the thin atmosphere is now breathable, but the climate is still frigid. Giant orbital mirrors have been built to warm the moon, and sulfur hexfluoride had been added to the atmosphere to create a greenhouse effect. Algae have been introduced to the water oceans to create oxygen. Typical weather is snow, or icy rain. Terrain is barren, with pools of slime and occasional hoards of terrestrial snails. Fluorite prospecting and mining are major industries – as vast amounts of SF6 are required for the terraforming. The gas is also exported to support alien terraforming operations. Food is produced in algal beds and energy intensive greenhouses, as well as imported. Snails are farmed for food. There is one major city, “Falstaff” (pop=80k). 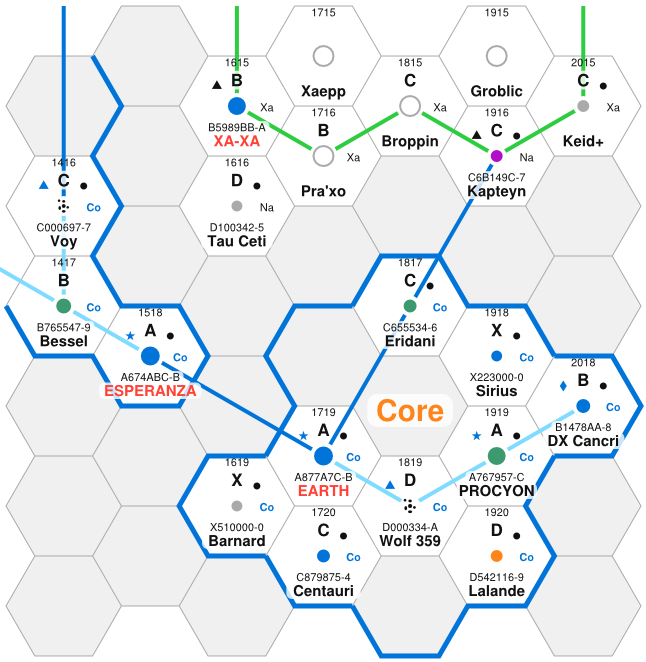 In recent years, the Esperanzan Commonwealth have stopped anti-matter exports to Eridani, as part of their blockade of the Core Worlds. This has lead to food shortages and rationing. Procyon was amongst the first of Earth’s off world colonies. Planted centuries ago by slower-than-light colony ships, before the discovery of jump drive. The earliest population was from Earth’s European continent. These people are known as the “Old Andorians”. In the centuries since, most immigrants have come from the Outer Planets (“Belters”), or Earth’s underclass. This is a balkanised world, mostly governed by mega corporations whose philosophy is akin to the mercantile spirit of Earth’s Belters. The largest corporate state is “Andor”. There is a global “Steering Committee”, which acts as a talking shop for intercorporate cooperation.